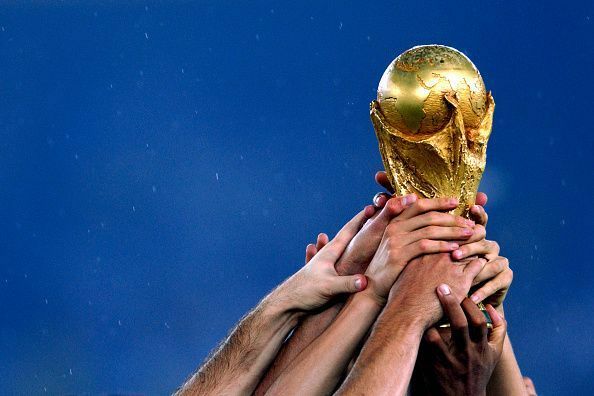 The FIFA World Cup is Football's biggest event on the international stage. Footballing nations from all over the world contest for the trophy and the prestigious title of 'champions' for the next four years. The first FIFA World Cup was organised in the year 1930 in Uruguay and since then football fans all over the world eagerly wait for the tournament every four years. The FIFA World Cup has been held every four years except 1942 and 1946 which was due to the Second World War, meaning that 20 final matches have been played up until now. As we draw near to the 21st World Cup final match between France and Croatia, it is time to recount the eight champion countries that we have had so far. Brazil has been the most successful nation at the World Cup. They have played in seven out of twenty finals and won the title five times. They are the only team that have qualified for every edition of the tournament. Brazil won their first World Cup in Sweden in the 1958 edition which was the introduction of a Pele to the world. They defended their title successfully in 1962 and became the only team after Italy to do so. No other team has defended the title since. Brazil's third World Cup came in 1970 in Mexico, which was also Pele's third World Cup win. Brazil's first final came in 1950 against Uruguay in their own backyard, Estádio do Maracanã in Rio. The game was attended by a whopping 199,854 people. However, they were defeated by Uruguay meaning that they still had to wait for their first title, which came eight years later. After 1970, Brazil went 24 years without winning the trophy. They reclaimed the title of 'World Champions' in 1994 with Romario. 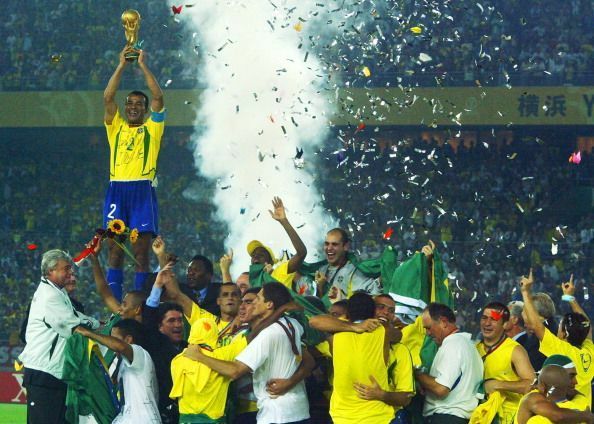 After losing the 1998 final game to France, they won their fifth and the most recent World Cup in 2002 with a team that included the likes of Ronaldo, Rivaldo, Ronaldinho, Bebeto, Roberto Carlos, and Cafu. Germany have played the most number of finals, with eight under their belt. They played six finals as West Germany out of which they won thrice. After 1990, they appeared in the tournament as Germany, playing in the finals twice and winning once. The German players with the FIFA World Cup trophy in 2014. The Germans won their first World Cup in the 1954 edition in Switzerland. The final saw the Germans clash with Hungary, who humbled them 8-3 in the group stage. But this time, the Germans won 3-2. After this, they reclaimed their title on home turf after twenty years in 1974 under Franz Beckenbauer. 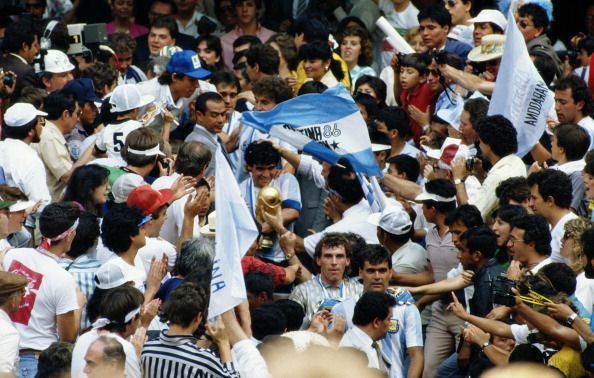 In the next four World Cups Germany appeared in the final match three times, first losing to Italy, then to Argentina and finally laying their hands on the trophy for the third time in 1990, winning 1-0 against Argentina. Germany's next World Cup final came in 2002 against Brazil who were playing in their third consecutive World Cup final. The Germans lost the game 2-0. And finally, after 24 years, Germany won their fourth World Cup in 2014. Italy were the team that introduced the art of tactical defending to the world through what they called Catenaccio. They have appeared in six finals and won four of them, making them one of the most successful teams at the World Cup, along with Brazil and Germany. Italy appeared in back to back finals in the 1934 and 1938 editions, winning against Czechoslovakia (2-1 after extra time) in the first appearance in their home tournament. In the second of the consecutive appearances, Italy defeated Hungary (4-2) to go onto become the first nation to defend their title, which was later replicated only once by Brazil. After 1938, Italy had to wait another 44 years to win the title again. In between which they lost a final 4-1 to Brazil. In 1982, they defeated West Germany to win their third trophy. Following that, they had to wait another 24 years to win the trophy for the fourth time in 2006. Argentina has appeared in 5 World Cup finals, and won two trophies to equal Uruguay. They won the trophy in 1958, defeating Netherlands 3-1 after extra time. They had to wait only another eight years before Diego Maradona led the Argentine side to their second and their latest World Cup victory. Argentine footballer, Diego Maradona with the 1986 World Cup. The 1986 tournament is the one with the infamous 'Hand of God' goal by Maradona, in the quarter finals against England. Uruguay have appeared in the World Cup final twice, and won it twice but they have also gone the longest time without reclaiming the trophy (1950 - present). 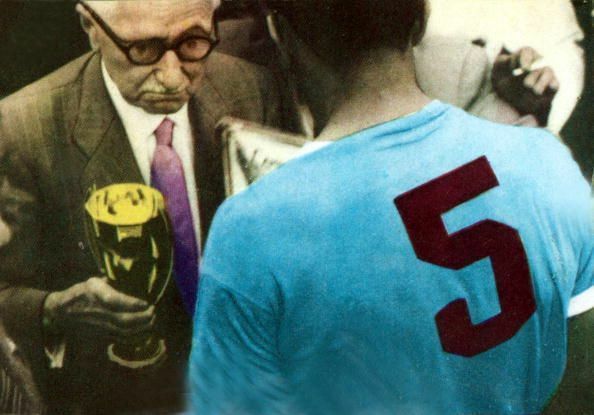 Obdulio Varela, the Uruguay World Cup winning captain of 1950, receives the trophy from Jules Rimet. Uruguay's first trophy came in 1930 when they won the inaugural tournament held in their country, defeating Argentina 4-2 in the final. Their next win came in the first tournament held after the 12 year break due to the Second World War, in 1950 when they won the Jules Rimet trophy for the second time. Ever since they have been in search of their third. 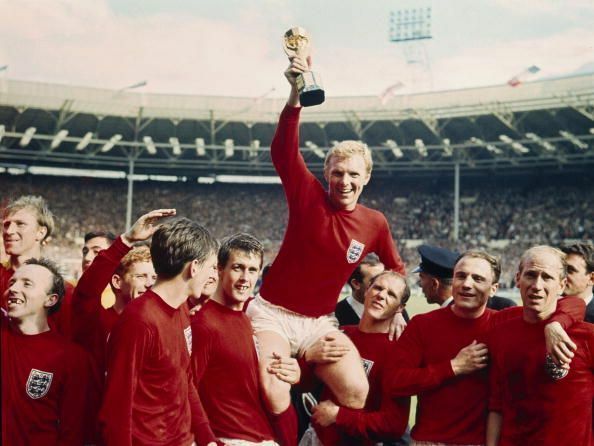 England, the inventors of the World Cup, won their first and only title in 1966. Sir Geoff Hurst scored a hat trick in the final, which remains the only treble scored in a World Cup final. 1966 World Cup Final at Wembley. England 4 v West Germany 2 a.e.t. 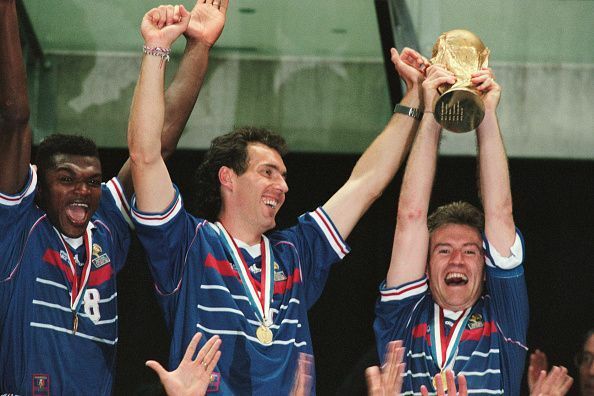 France won their first, and at the time of writing, their only World Cup, in 1998, with a comprehensive 3-0 over Brazil, with Zinedine Zidane netting twice. Their chance to reclaim the trophy came in 2006 in a controversial game, which saw Zidane sent off, before Italy went on to claim the title on penalties. 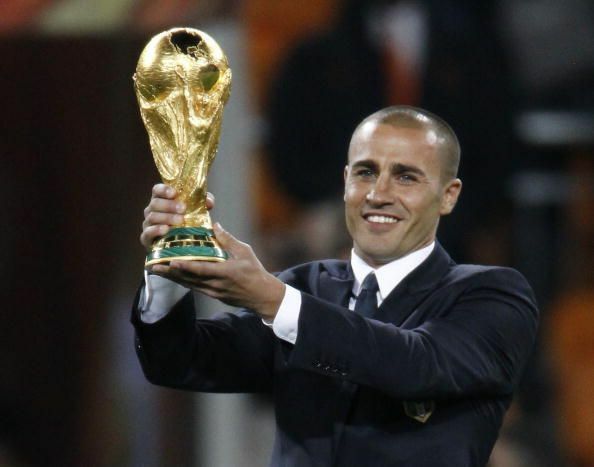 Tiki-taka and possession football that has now arguably become the downfall of the Spanish team, eight years ago won them the biggest tournament in international football. In the 2010 South Africa edition of the World Cup, Spain defeated Netherlands 1-0 after extra time to become the world champions for the first time.